Archaeological sites in modern cities are usually conceived as disconnected islands in the contemporary urban fabric, visited more by the tourists than the local citizens. 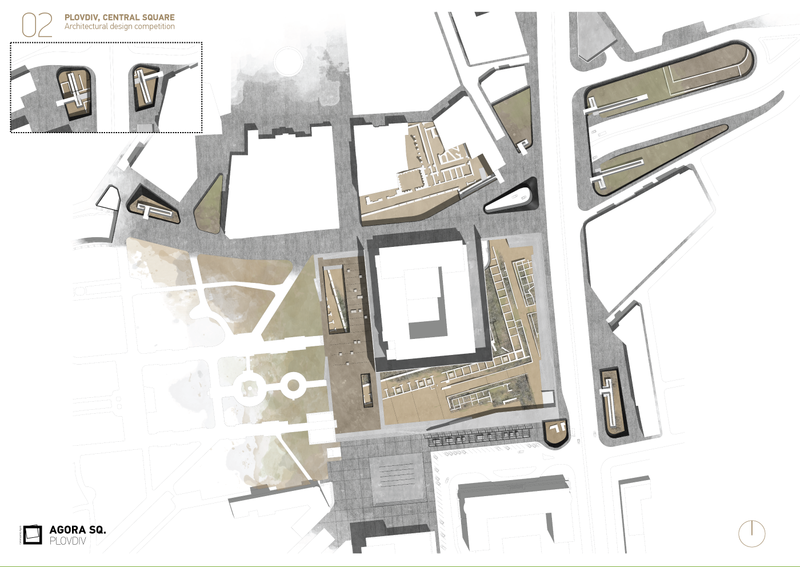 This proposal is challenged by the idea that the central archeological site (the forum) should become the central public space of the modern city. The Earth , the Wind and the Water characterize in a different way the major interventions of the site. Challenging the idea of archaeological sites as active elements and parts of theurban public space and time, the competition entry proposes theextended excavation and revelation of the ruins of the roman forumand their socialisation and integration in the contemporary urbanfabric as part of its central public space. The elements of earth,wind and water characterise the proposal which includes interventionsin multiple different scales. The“agora” emerges in two levels: a. The “Forum Square” (160m)and b. the “Linear Square” (161.5m). Both levels are connected tothat of the contemporary city of Plovdiv through a zone of largestairs and ramps that surrounds the “archaeological park”. Thisframe, as a sculptural object itself, sets off the valuable“interior” and at the same time it functions as the auditorium ofthe spectacle that is “staged”. 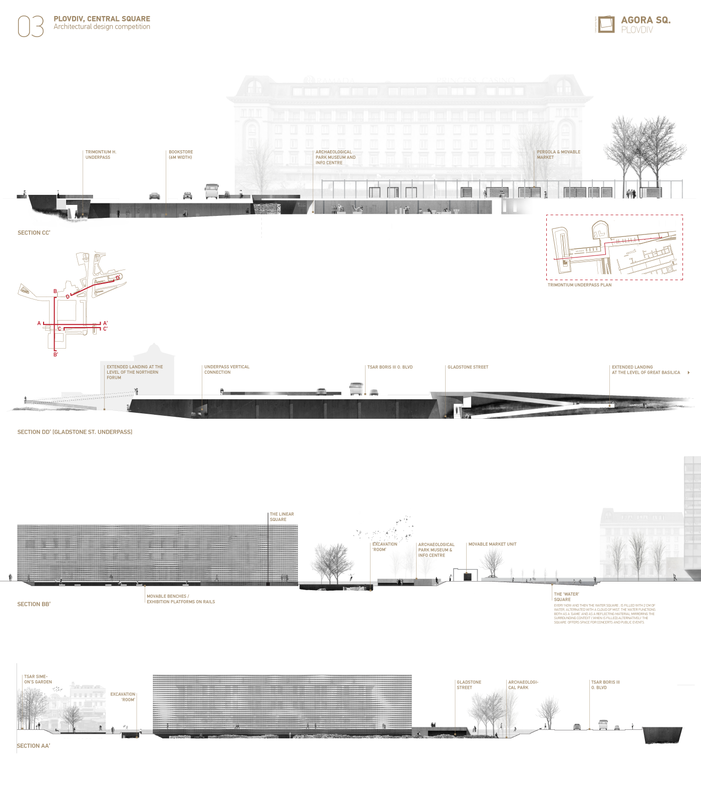 ThePost Office building (not a part of the competition itself),dominating the central part of the ancient forum takes on three ofits facades (those facing the archaeological park) a second skin indistance, allowing a perimetrical corridor. This skin could functionboth as a sculptural -transformed by the wind- surface during the dayand as a controlled cubic light box of projections at night. 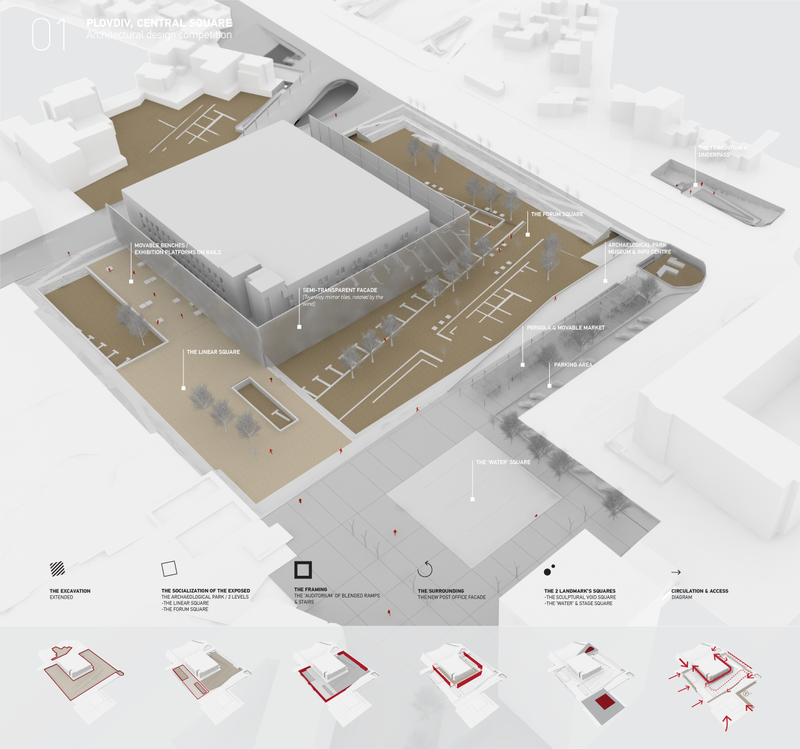 Thecontexture of the competition area “gets covered” with acommon/same material “urban carpet” uniting all parts of publicspace of the intervention together: the “water square”, the“sculptural void square”, the small museum/info point and thecorridor of the movable market. Theinterconnection of the city’s extended archaeological park isachieved through distinct vertical rooms/gardens that underpass themajor city roads in specific points.